What is Capitalism but a way of life for many who want to get rich. Communism gets a bad rap for its ability to stifle innovation and effort. However, when you look at Communist China, growing at 7-9% GDP per year, do you really think its citizens have no desire to improve their living standards beyond what is generally proposed? We all have an inherent nature of wanting to do better. Not only do we want to continue improving, we also want to one-up our peers! After all, what’s the point of making $100,000 dollars a year if everybody else makes the same? We learned a good amount about how the happiest people on Earth live after my 2.5 week trip to Scandinavia. So, I decided to take a trip to Chongqing, one of the fastest growing cities in China to learn more. The first thing I asked the cab driver when I arrived was how his life has improved over the years. I thought he’d be ecstatic, given Chongqing has been growing at a double digit rate for the past decade. Instead, he was bitter. By the time we got to my hotel, the cab driver was flustered beyond belief. I thought he was going to have an aneurysm as he complained on and on about how hard it is to get ahead. I empathized with him through the smog and the eight million city residents who seemed to have no regard for traffic signs. 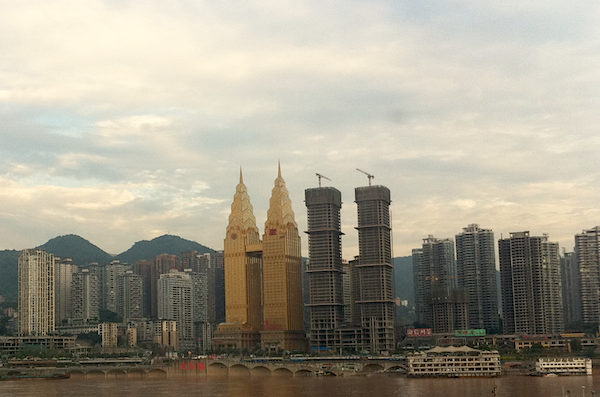 All you notice when driving into Chongqing are the construction cranes everywhere. My cab driver’s personality matched the climate – fiery! Why not a twin gold hotel? 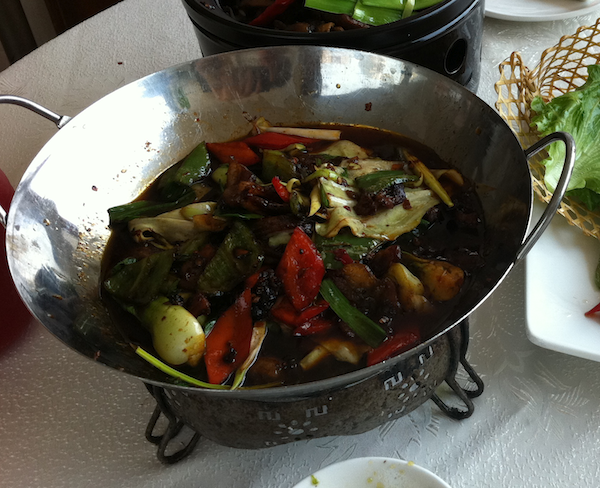 Chongqing is famous for its hot pot cuisine. We’re not just talking temperature hot, but spicy hot chili infused hot that will burn your intestines from the inside out. I love spicy food in the beginning, but I almost never enjoy spicy food in the end! Living in America for the past two decades has made my body soft. Too many ice cream sandwiches, donuts, and lemon meringue pies I must admit. As a result, there is no more lining as thick as an elephant’s rump to protect me from harm. After eating what seemed like a buffet of chili oil, I almost died the next day as I pissed out of both ends. The hot cold sweats beaded over my forehead as I dared not stray more than five feet away from the bathroom. Thank goodness China has largely done away with squat toilets, unlike when I first visited in 1997. Holy hell my legs had a workout. Only after I became sick did my friends tell me to be careful of the Chongqing chili oil. Thanks guys! Duly noted for the next time I visit. My tour guide said, “Our food is as hot as our souls. We will do everything possible to take advantage of this economic transformation to get ahead!” I believed him. Would you like some vegetables with your chili oil? The Yangtze River, also known as Chang Jiang is the third longest river in the world at 3,988 miles. The water comes from the glaciers on the Qinghai-Tibet Plateau in Qinghai, flows eastward across southwest, central and eastern China before emptying into the East China Sea at Shanghai. At the eastern point of Chongqing, you can stand and watch the Jialing River and the Yangtze River collide. It’s quite peculiar to see water flow in opposite directions, eventually combining to become one great force. If you can’t tell by now, the Yangtze and Jialing Rivers are nothing like the crystal blue waters of the Bahamas. 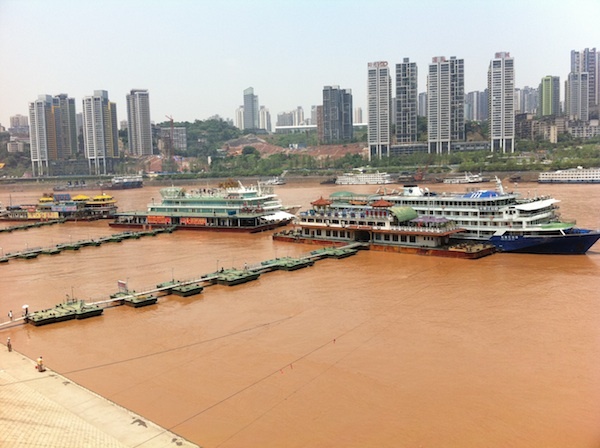 The rivers churn tremendous amounts of mud and pollution as they pass some of the world’s most industrial cities. I stood at the edge of a cliff looking down in amazement until I finally started to feel sick again due to the 98 degree heat and remnants of chili oil oozing out of my pores. “The Yangtze River is our pride and joy. It allows Chongqing to be a major manufacturing centre and transportation center for Southwest China,” explained my guide. With a per capita GDP of roughly US$5,500, Chongqing ranks 13th among all Chinese cities. The top three are Tianjin, Shanghai, and Beijing with per capita GDP levels of around US$12,500-$13,500. In other words, in order to catch up with China’s biggest cities, Chongqing has to triple its income. Imagine a 3X income differential for those who live in the Midwest vs. those who live in San Francisco, Los Angeles, and New York City. Actually, this is not hard to imagine at all as it takes over $150,000 a year in San Francisco to afford similar luxuries as someone earning $50,000 living in Des Moines. I’ve got several friends who live in Middle America who want to make more money. When I ask them why not just move to parts of the country where the economy is booming, they tell me they can’t leave their families behind. They also tell me they find housing prices to be outrageous in booming cities, not thinking that it’s because incomes are “outrageous” and quality of life is “outrageously better” that leads to higher costs. It’s weird how in a day of buses, trains, and planes, folks aren’t willing to buy a ticket to a better life. 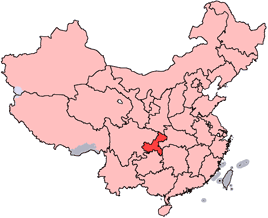 In Chongqing, residents are also hesitant to move to the coastal cities of Shanghai, Beijing, Shenzhen, and Guangzhou as well. But, it’s not because they don’t want to get on a train or a plane. 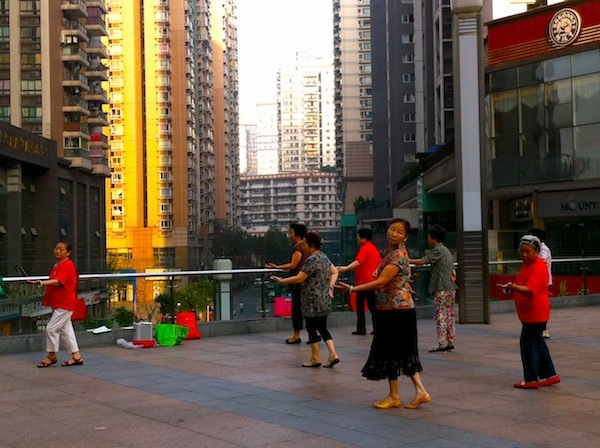 They don’t want to move because Chongqing is growing at a much faster rate than its coastal city sisters. They don’t have to move! Whereas if you are part of a dying textile or auto manufacturing industry in Michigan, it might be best to develop some new skills and reinvent yourself in another part of the country. Easier said than done of course. “Sam, I love it hear in Chongqing. In the next 10 years, we are going to be a powerhouse and the envy of all of China!” explained my guide. I’m sure the residents of Chongqing will grow wealthier. I’m just not sure foreigners will envy the heat and pollution. Many will argue that China is more capitalistic than America, especially since China has a massive capital account surplus. America on the other hand, has a current account deficit plus a growing budget deficit thanks to unrestrained government spending. The American government is trying to narrow the gap between the haves and the have-nots by becoming more like China and Europe. However, China is fast becoming more like the US. Funny how everything seems to converge. China is in its growth stage and will likely be the #1 economy in the world by the year 2035. The Chinese will turn from net exporter to net importer as they buy all of our stuff with their super middle class. Their citizens will grow in size and weight as we Americans have done. Services and health industries will explode in profitability as a result of new wealth. Let’s hope they have a benevolent leader when its time for them to rule the world. To understand Capitalism, we must first understand Communism. Based on my week long trip to Chongqing, China, Capitalism and Communism are becoming the same. What’s indisputable is a person’s desire to better their own lives with the limited resources they have. If there’s a chance for any of us to get ahead, we’ll rationally do whatever it takes to get there. China and the Western World are more alike than we think! The oasis after a day exploring in 98 degree humid weather. Bathroom close by! NYC and San Fran are expensive, but the opportunities outweigh the prices. I’ve switched firms 3 times in 7 years, each time for more $$$. If I got stuck in a one-company town, those opportunities don’t exist. I’m scared to think what a world ruled by China would be like given the current values there. A lot of immorality and disregard for other humans from my perspective after living there for a year. I guess some of that is just the level of competitiveness necessary to survive and improve one’s standard of living. It seems like the rich tramples the poor, and the poor just take it. Also, it seems like many young women are expected to be pretty and servile. They willingly play that role of “I’m too delicate and weak to work hard or think for myself” in a manipulative way. On the other hand, a guy’s mateability is largely dependent on his ability to make good money. Basically, a lot of relationships are transactions and not love-based, and with the inevitable infidelity that follows as well as the wide availability of prostitution, I felt that sexual morals were definitely lacking compared to the US. This was in a big city (Shenzhen), but overall not the type of innocent environment where you’d want to raise kids. Awesome post, Sam! I am a fan of your blog and enjoy every bit of it, the advice and your insight is great! Sichuan food will definitely make you run off to the toilet if you’re not used to food drenched in peppers! I just love having a nice scorching dish of fish and washing it down with a cold beer! Having lived in HK for a bit of time, I always found myself in Shenzhen almost every other weekend and have to say that the change has been unimaginable in just the last 10 years alone. China is definitely very capitalistic and only “communist” on paper as they control the flow of information, freedom of speech, etc. But in terms of business/FDI, they’ve had a massive boom these last 3 decades and are far more capitalistic than us here in the states. In terms of the major first tier cities in the mainland, I feel that the standard of living and potential lifestyle one can have is much more better than some towns here in the US. The options one has when going out for entertainment, dining, etc. is quite vast. Too bad the USD to RMB conversion isn’t as great as it was back in the early to mid 2000s! The pollution is quite bad but I can tolerate it (lungs become accustomed to the terrible air, haha). If I had a choice to live in the mainland, it would probably be either Shanghai or Shenzhen though! Crony Capitalism (not the same thing as true, free market capitalism) and Socialism/Communism are being merged so that there is no distinction between the two. I think when we became part of a global economy, everyone had to evolve including the communist countries. If not, they would have been left behind. Even a Capitalist powerhouse like the U.S. is evolving and changing. We used to outsource everything to lower our costs, but now it makes sense to bring some of it back. When oil was over$100 a barrel, it made sense to do more exploration domestically. Slowly, we are becoming less dependent on Middle East oil. Although every country is evolving, it is more shocking that communist countries are becoming more Capitalistic. BTW, I was in Taiwan in August years ago on business and the weather was unbearably hot. I was told to avoid the Far East in the Summer at all costs because of the weather. My brother is a businessman in Shenzhen and he once told me there are two main capitalism country in the world: US & China. Visited China couple times with friends, first trip in the early 90’s and a few more trips afterward, stayed in the big city like Guangzhou, small city like Jiangman, the countryside and travelled to Jilin. We actually go everywhere with the locals, my friends’ relatives, parents friends and their kids. The air in the cities are polluted. In the countryside, it is very nice. Once you get to know them better, what the average chinese want and chasing after is not a lot different than Americans – they want to have a better standard of living, be able to provide for their family, kids, take vacations, buy a place etc…..there is so many people in China, competition is fierce, in order for them to obtain their dreams, they work twice if not more as hard as people in the US. One thing I noticed is that there is optimism and people believe their life will get better as long as they work hard. I feel a lot of optimism and excitement in the air as well every time I visit. But the cab driver’s feedback in this article I found fascinating as it just proved that everything is relative. How are the women in China compared to America? China is no longer communist and hasn’t been for many years. They combine totalitarianism and state capitalism -which is basically the same thing as Facism. As long as the state doesn’t harbor military ambitions, the world need not worry. How likely is that? We shall see. I suppose you could describe the current Chinese regime as facism. There is a very thin difference between facism and communism. Regardless, the Chinese government has excessive power over its citizens. You have one political party with a monopoly and there in lies the problem. The positive thing is the extreme shift which has occurred over the last 15, 20 years. A rapidly rising Chinese middle class is pushing the government in a more moderate direction. I think you will see some form of democracy in China at some point. Not well versed with China nor Communism – nevertheless I enjoyed the article and it opened my eyes. Harsh as it may seem, inequality pushes people to be better. China took away their people’s empowerment to make their lives better…and that’s sad. Just another reason why I love being a capitalist! Funny, I’ve been having very similar thoughts since moving to Beijing a few months ago. I live in an area called ZhongGuanCun, also known as the Silicon Valley equivalent. Not only have I been shocked by the amount of wealth I’ve seen so far (who doesn’t have an Audi or BMW around here? AND, I’m sure it was paid for in cash), but I can’t believe what a limited understanding I had of the Chinese wealth and development that had occurred. Sure, I always knew they saved 50%…and strive to do the same myself…but I never thought they had this much wealth. Oh, and the airports and public transportation system, I sort of think they put NYC to shame, with everything being so clean, timely, and fast. Don’t even get me started on how nice shopping is in Wangfujing. Do you have Chinese citizenship, Sam? I don’t Irene. I’m American. What brings you to Beijing? I used to study at Bei Shi Da on san huan lu. I remember riding my bike through the hu tongs to the Forbidden City and eating yang rou chur and Yan Jing Pi Jiu at night. It was a magical time, 1997! a work assignment in the software industry brought me to beijing. 1997 sounds like it was a magical time! Hi Sam. I love your articles but sometimes the jibes towards middle America get a little old. I’ve lived on both coasts in very trendy areas. While I had a great time there as a single person (like you), it’s definitely not the right fit for my family. Many of my college friends from Stanford stayed in the Bay Area. At a recent reunion, after the initial ribbing about my midwestern life, most acknowledged that life isn’t so easy even on 300-400K. Say you and your spouse are both physicians with 3 children in SF making 400K/year. Good luck having a nice house, sending them to good public schools, have a reasonable commute, take nice vacations, save for retirement, save for college, manage your daily living expenses, and pay your Fed/State taxes. Yes, there are internet millionaires/billionaires (I know some of them) but they are definitely the outliers. I’ll still read your articles but when you constantly berate those of us who have found amazing opportunities outside SF and NYC, I’ll laugh at your misguided musings. Why can I say that confidently? Because we are debt free (including house), multiple 7 figures in assets, high paying jobs, kids in amazing private schools, great group of friends, great country club, short commute, and we travel the world with our family (India, Greece, England, France, Costa Rica, Italy, Peru, etc.) What would our life be like in Palo Alto …. a shell of my present existence. No thank you. As for China, I’ve never been there but I’ll report back when we get around to vacationing there! Oh come on now, what’s a little poking once every couple of years! I thought the analogy was quite pertinent since Chongqing is in the middle of China (see map). Those of us on the West Coast need to occasionally jab at the Midwest because we are jealous of such low cost living you guys have! $400k salary gets you a pretty great life even in SF. Only a fool would not be able to make that type of coin work pretty well. You are exaggerating quite a bit. Yes, I have lived in the Midwest too and some of the stereotypes from the Coasts are a little extreme. There just isn’t much innovation or a global focus in the Midwest, so there aren’t as many opportunities for people to make $400k. Even the most innovative cars in the US aren’t made or designed in the Midwest anymore. ??? I don’t know dude….. Chicago seems pretty darn global to me! I respectfully disagree that I am “exaggerating quite a bit.” My wife and I could move tomorrow to Palo Alto or San Francisco and make >$500K. (We are fortunate to be physician sub-specialists in highly sought after fields.) That being said, if you look at the criteria I mentioned before in my post, we definitely could not lead the same life I do now in either of those places due to more expensive cost of living. I’m not saying we wouldn’t have a nice life … of course we would. It would involve much smaller home, public schools, no country club, no expensive vacations because we would have to save a larger portion of our income for retirement, investing, and college savings. It’s just math … we would simply have much less discretionary income due to the cost of living. Also, as you know, there is a huge cost in NOT having money invested for decades because it is being deployed to pay for one’s house, taxes, etc. The bottom line is we just wouldn’t have the financial freedom that we enjoy now. I love visiting NYC and SF. They are both great places and I have many dear friends who live their. For our situation, it doesn’t make sense financially. Before coming to California, all I knew about America was living in Virginia and NYC for 10 years for HS, college, and work. Then I visited California one summer and fell in love. I had no idea such a great place in the States existed. I’m sure once many folks from the East Coast and Midwest come visit, many will want to relocate. Might as well live as great a life as possible. I say most, but not all of course. And I have lived everywhere around the world. It’s pretty good out here. All I am saying is that you can live quite nicely even in the Bay Area on $400k. You said, life isn’t so easy on $300-$400k. Yes, you can have a nice house in a nice neighborhood with good schools, with a reasonable commute and take nice international vacations. I know, because my brother, who is a doctor and his wife, who is a nurse, do exactly that with about $300k in salary with 2 kids in Marin County. Your situation is somewhat unique, because you can make your same salary in most parts of the country, but for many tech workers their companies and jobs do not exist in the middle of the country. They need to be where the innovation is and that certainly is not the Midwest (or at least about 99% of it), which I can attest to as a former resident. I can definitely live a very comfortable life with a family of 3 or 4 living off $300K-$400K! To not be able to do so would be seriously problematic. I’d like to retract “life is not so easy” and insert “life is not as easy.” As I mentioned, one can definitely live a comfortable life on 300-400K in the Bay Area with 3-4 kids. I simply won’t give up the decreased financial stress for a supposed ideal geography … to each their own. (I’m relatively risk averse and I value having a big war chest.) You will simply have to accept some lifestyle changes and have less savings if you wish to stay in the Bay Area (dollar for dollar) compared to other nice places to live. (For example, our savings rate is close to 40% gross income.) I agree that our portable financial situation is unique and not applicable to other fields. How big of a financial nut are you trying to accumulate before retirement or considering yourself financially independent? Great question …. I’m not sure. We actually want to downsize when the kids are out of the house. I wouldn’t change the present, but I don’t want to cling to a big house and ritzy lifestyle forever … that gets boring too! There is a time and place for everything in life. When we are empty nesters, we would like to volunteer (local free clinics and medical missions abroad) and travel for more extensive periods of time. We still want to live here as we’ve built a life in our city. If I go part-time at age 50 and work a couple of days a week (about 5 years from now), I would not need to touch my investments for 12-15 years. (Neither would I need to fund them either!) Also, the house, the kids college educations (even 4 Harvard tuitions), and our smaller new retirement home (same city) would all be paid off at that point. I guess that’s my idea retirement for now. We could stop working at age 59 1/2 or continue on till 62. At that point, using conservative numbers, we should have >$6million plus social security. Sorry if my posts are off topic from your article. My major point is that where one chooses (or is able) to live seriously impacts their financial life. For me, having the ability to have all my financial house in order at a relatively young age is priceless. The lack of financial stress really affords me the ability to live life more on my own terms, rather than being held hostage to financial obligations. I also recognize I am an outlier as most physicians are terrible with their finances. I also feel badly for the new doctors coming out … $700K in student debt is becoming the norm …. 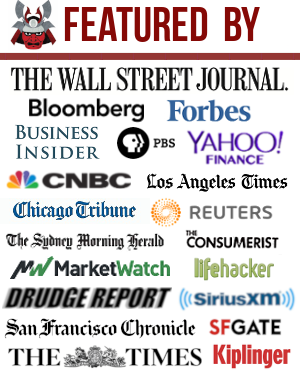 just ask the White Coat Investor! That’s a big hole to dig out of no matter what your specialty is. My wife and I graduated at just the right time and got lucky. Also, I took a calculated risk to start my own practice: no risk, no reward. $700K in student debt? Is that possible? Obama is going to forgive after 10 years right? Thoughts on dying with less than $5 million to avoid the estate tax? Do you feel $6 million+ will be enough, too little, or too much at age ~62? What do you plan to do with it? If you train for 5+ years after medical school, you can easily have 700K in student debt; others have written about it. The sad thing is that they aren’t even living large with student loans! I just met two resident physicians (married during medical school) who have over $1million in student debt combined. Remember, the interest rates are high for student loans, interest in not deductible, and this debt cannot be forgiven even with bankruptcy. I seriously doubt the government is going to pay off this debt without the medical student providing military service, etc. Doctors make less in saturated markets like LA, NYC, SF too. The estate tax for married couples is about $10million. We definitely won’t come close. As for whether $6+ million plus social security will be enough at retirement, I’d say definitely. Short of having a serious gambling problem or drug addiction, I really don’t know what we would do with about $250K/year (using 4% safe withdrawal rate plus SS) as retirees when we have no debt and low overhead. Maybe I’m a little too conservative financially, but I’d rather err on the side of having too much than too little. You never knows what life throws at you! Besides, it’s not exactly like we are not enjoying life and splurging now. I agree, the midwest is actually quite nice, but the poking goes both ways. People in the midwest make fun of California and NYC folks fairly often too. The coastal areas have much more non white population, so for an ethnic minority person in America like Sam, it’s probably a much easier place to live. As for majority of white people who poke fun at the midwest, my personal observation is that a lot of it boils down to religion which manifests in feeling of superiority by the coastal people. There are many agnostic and atheist people in the coastal metropolitan areas who tend to look down at the religious midwest and the southern people for that reason alone. When someone is independently wealthy, where one lives doesn’t matter all that much though. Mark Cuban, Warren Buffett, Jerry Jones, the WalMart heirs, all live in non coastal areas and probably have great lives. I don’t believe the Midwest is really all that religious. The Southern states tend to be. Midwestern cities (especially surrounding the Great Lakes) tend to have fairly diverse populations/life styles and agnostics/atheists are very common. It’s been my observation that coastal folks tend to be confused as to where the Midwest actually is. Hint: Oklahoma is not the Midwest. And neither is Kentucky. My point exactly. Most people can have a great life in many different places as long as your relative expectations are not too high ie. expecting a large single family house in midtown Manhattan … at least for us mortal! Living in the Midwest- I couldn’t agree more! I would not want to raise kids in California based on the materialism, etc. Great reply! I do wonder about the diversity of the Midwest though. Because I grew up overseas and attended international schools, it might not be as enjoyable for minorities to live in the Midwest. I assume all of America will become very diverse, eventually. But it starts from the coasts and works its way in and we are not there yet. Have you guys ever lived overseas? As others have noted China has grown faster than India for the simple reason India is a democracy and you have the old not in my back yard kind of thinking which slows progress, China has none of those constraints which in the short term is good for growth. Long term who knows. Did you have problems with internet there – great firewall of china? You can’t connect to FB or Twitter in China. I’m sure other sites too. The news is controlled too. Glad you liked it. You should share your stories about Munich one day. I hear that city is rocking with growth! Interesting read Sam. I’m curious, what brought you to China? Business trip or pleasure? I try to find pleasure and business in all my travels as a writer. My family has experienced both communism and Nazism. Neither is good. Better to avoid living in these states. The Chinese have certainly succeeded in creating a blended capitalist/communist state, but I don’t know. The people are wonderful. The government is terrible. I do think the rapidly growing Chinese middle class will continue to moderate the government over time. That would be the best outcome in this situation. I learned that the founders of BMW had heavy Nazi ties. I did some research, and they employed 50,000 slave laborers during wartime. I don’t think I can buy another BMW again, especially since the heir is worth $15 billion and NOT donating that money back to the families they took advantage of. Do you buy any Made in China products in America? China continues to occupy and destroys Tibet’s culture while demanding Japan apology for its atrocities during WWII, go figure. Nazi’s aren’t any better or worse than China, America, or any other stronger nation who took advantage of weaker neighbors. I say go ahead and buy that BMW if you like their products and not let geopolitical issues creep into your product purchases. Well….. Just about all the German corporations had slave labor during World War II. There was a labor shortage; they did extreme things. None of it good. You flew on a jet airplane to China….German World War II technology. NASA – Space program. Apollo missions – German technology/scientists/engineers. The U.S. had slaves. We had a civil war. Abe Lincoln won. I’m not sure if history is a good reason to reject the products. I’m just saying that countries with these type of governments are best avoided. Oh Sam, the detailed communist stories I could tell you second hand from my boss who lived in Vietnam until his mid twenties. His father was one of the top businessmen in Vietnam with a wide range of industries from lumber to movie theaters to Honda motorcycle sales. Let’s just say, extremely wealthy! Then the communists came in, changed the monetary system (so now your cash is worthless), told you how much profit you were allowed to make, who you could associate with, and reviewed every movie before it was shown in your theater. Seeing no real future, my boss got his wife and infant daughter on a small boat and slipped out of the country in the middle of the night. After a lengthy process, life started all over for him in the US…minus the wealth of his father who stayed behind to work for the communists until his death. The whole story is the kind you read about in books. It certainly made me appreciate the US much more. Note: While Vietnam has more capitalist traits today, like China it is still run as a communist state. I’ve never been to Vietnam. Definitely on my bucket list, along w/ Cambodia. Thanks for sharing. Interesting article Sam. I have visited China (Beijing) once. It was a great experience – I was on business so a bit different than going on personal time. As you and others have noted, the pollution and lack of overall standards controls ( food, building, etc.) is a bit scary. I am not sure I would consider living in China in the future but you never know. You asked the question: “Why do you think communist China has grown more quickly than democratic India over the past couple of decades?”. While I have been to China but not India, I perceive that one core reason that China has grown is that China gets the fact that you need a good infrastructure in order to effectively grow the economy. Absent a quality & controlled infrastructure, they will get no where. For example, I have read/heard stories about how some of the US airports look 3rd world compared to the 21st century airports that China is building. Again, some of the standards (ie. building standards so that we don’t see buildings – as I have seen stories – just falling over after they are built in 5 days) are a bit scary but they understand that they need to build a core infrastructure. It doesn’t appear that India has figured this out and there is so much lethargy in getting stuff done in India, it causes huge issues in growing their economy. When the Communist China government decides that they need to get something done, building infrastructure or otherwise, there is little that causes delay – this can be a curse and a blessing! Infrastructure is definitely important, and India is severely lagging. People are getting extremely rich in India too, but not at a similar pace. And the poverty in India is much more ubiquitous than China. So China has more wealthy people, less impoverished people, and a stronger middle class w/ Communism. So much good stuff here, Sam, from a convergent view of differing economic systems, to liquid pooh stories, and, best of all, a bit on the psychology of the common man in China. In the end, we don’t just want to get ahead…we want to get ahead of our neighbors. Comparative wealth matters more than absolute wealth. We really are happier when we’re better off than the guy next door. I’ve heard recent horror stories from people who have traveled there which makes me uneasy still given that I can’t speak the language. Had a friend of a friend get mugged, driven around, emptied his bank account at various ATMs, and then abandoned in rural China. A lot of people get upset at China because of their lack of regulation on pollution, but they’re argument is that the U.S. didn’t have regulations either when we were developing and we did a lot of messed up things to the environment as well. Some of my Chinese friends say, “when we’re done developing, we’ll put regulations. Just like you guys did.” Can’t really argue with that too much. Smart. Can’t really argue with that logic either! The pollution is HORRENDOUS. Seriously, even if you are a billionaire in China, the population doesn’t treat you any better. Yeah, if we don’t completely ruin our planet in the meantime that will be great. Sorry, but China doesn’t have hundreds of years to figure out how to keep pollution under control like the U.S. and other countries did during their industrial revolutions. The hour is late. Predictions about China or any other countries are fun to make, but a lot of China’s future world dominance is fear mongering by the Western media in my view. In late 80s and early 90s, Americans thought Japan would take over the world too. I haven’t been to China, so can’t comment directly about quality of life there, but since wealthy Chinese like to buy properties in America, send their children to be educated here, it seems they want to hedge against the Chinese system in some way. Also far more Chinese immigrate to U.S. than the other way around, so I would still believe even most Chinese believe life in U.S. would be better. In any case, the global economy isn’t a zero sum game, so if China continues to do well, then the entire world will benefit from it. Only the misinformed or super nationalists believe in order for China to do well, it has to come at the expense of U.S.
Hope this post didn’t come across as fear mongering. The discovery is that Chinese people and American people are very much interested in the same: getting wealthy and leading less stressful, happier lives. And in my eyes, having been to China many times, the Chinese are WAY MORE hungry than Americans in building wealth b/c they SEE the potential from other countries. I agree completely that both Chinese and Americans and everyone else also want to lead happier, wealthier, and less stressful lives. Since you’ve been to China, I’m sure you know much more than me, but I think if someone is very wealthy(above $20 mil networth) , it really doesn’t matter where they live. They can live very well in most places as long as their personal safety isn’t threatened due to political instability. However, for most middle class and below, I would bet that U.S. and most of Western Europe is much better place to live than China. Also, I tend to believe that Chinese are WAY MORE hungry in achieving “success” compared to their U.S. and European counterparts because they have to be due to their immense population who are mostly poor. There’s just too much cheap labor migrants from the countryside in China, so the average person has to become super motivated or just get crushed in an extremely competitive society. I could be wrong, but from what I understand, Chinese people have their children in America because it’s cheaper to have a second child in the US than it is to in a Chinese hospital. Sam, another timely and interesting article for me to read. A couple of notes though…first off I am no sure about the textile industry, but the auto industry is booming in Michigan not dying. Funny how people outside of Michigan or the Midwest perceive things…volumes are at their highest ever factories running 24/7, new programs kicking off one after another. Honestly it has never been better…I think you’d be shocked at the number of auto industry multi-millionaires in these low cost states like Michigan. If you’ve never traveled here I’d suggest it is worth a visit. It would be interesting to see if you still believe that life in San Fran is “outrageously better” after checking things out…I’d be happy to be your tour guide! Nobody in the auto industry has actually lived or worked in Detroit since the 60’s. I’m busting your balls a bit, because I really like San Fran area as well, but the Midwest is not quite the boring hell on earth people on the coasts make it out to be. On another note, I’m actually considering doing a start-up in the Shanghai similar to my auto based business here in Michigan…planning a visit this fall to start the leg-work and see if it is a worth while venture. The real question for me is not if it can be successful, more of do I really want to live there for 3 years or more as I get it rolling. Do you have family in the city you visited…just curious because Shanghai is about as westernized as New York city these days with all the ex-pats living there. I’m sure there are a lot of auto industry multi-millionaires. How can there not be with such MASSIVE government bailouts and support? :) $10 billion for GM, and a $1.2 billion hit for Chrysler ain’t chump change. That’s mega change! I will take you up on being my tour guide next time I’m in Michigan, just not between Nov-April. I’m just playing with y’all in the MidWest. How else can I help justify the outrageous taxes here in CA? Shanghai is great! But, expensive and polluted. Just not as bad as Beijing. LOL, I hear you Sam, but non of the multi-millionaires work at the companies that were bailed out…they are all the small and medium size business owners who are fiscally responsible and manage their businesses like it is their own money instead of like how the government does. Somehow I’ve been able to squeeze out a 7 figure income in this dying industry for the last 10+ years. I totally agree they should have let the auto companies and banks fend for themselves. My companies actually prospered during the Armageddon in the auto industry because there was a flight to quality suppliers and the riff raff ended up going out of business, we were disciplined while most were not. Funny about the whole bailouts…everybody’s darling Tesla wouldn’t even exist right now if it were not for the government trying to pick winners and losers and granting them a half a billion loan…oh and then subsidizing their sales by having all of us pay a $7,500 tax credit on $80k cars that have no economic reason for existing. Definitely DO NOT come to Michigan until summer time…Nov~April is when we are all traveling to tropical locations anyways! I don’t know how you guys do it out their in Cali paying so much in State Income tax, but I can imagine it does make people really question why they are working so hard just to pay so much to Uncle Sam only to see it mis-managed. I love the stories out in Cali about bankrupt cities that are paying pensions of $400k/year to people who worked for 20 years…that would drive me nuts! Bankrupt cities paying $200,000 – $400,000 a year is a way of life in CA. That’s why we ROCK and why we thank the rest of the nation for bailing us out in the future. It’s the American way. Go Tesla! Stock is on fire, and the subsidies are awesome. Government makes certain people wealthy. Be on the right side of the fence. I couldn’t agree more, ineptitude is definitely very fashionable in industry and politics. I’m definitely learning though to fight stupid with stupid and end up on the right side of the fence! Tesla paid back their federal loan. The feds will never actually get those billions back that went to bail out Chrysler and GM. It is gone forever, although you can make an argument that it was worth it economically. On the 7,500 tax credit, I agree it should go away, but I also think our gas taxes are far too low for the huge amount of damage buying foreign oil does to our economy and what burning huge amounts of gasoline does to our environment. We subsidize SUV and gas guzzlers made by Detroit through our foreign policy and military budgets. Even then, the Highway Fund is bankrupt. Battery technology is evolving so who knows what happens in 5 years. “Yah all” is Southern not Midwestern. The Midwest basically consists of the northern states which surround the Great Lakes. These are traditionally very liberal states. Milwaukee actually had a socialist mayor for years. Y’all is the way I talk. I grew up in the South for HS and College. Its chump change compared to what it took to bail out your former industry, Sam! 1. violence. there are part of new york, chicago and los angeles that look like a third world countries if not worse. i am talking about burn out building, car tires burning in the middle of the streets. 2. gang violence in america is far worse than china. santa ana located in orange county california where the average home prices are the highest in the usa. yet downtown santa ana is infested with mexican gangs. even fbi and cia officers are afraid to walk in downtown santa ana after dark. 3. gun violence in america is far worse in america than china. using santa ana as an example there is 1 murder a week in this city of about 200,000. i know of cities in “third world” country like vietnam that has a population close to a million and yet they have 1 murder per month. if you read american history in the 18th and 19th century, pollution in chicago and new york at that time were the same as what china is going through right now. american as a whole are brainwashed far more than they know when it come to country like china. the chinese generally do not trust anything they read in the newspaper. Interesting perspective. The violence does seem to be quite a bit more in the US. But maybe it’s b/c the media loves violence, and China’s media is government controlled, so we don’t really know what’s up. Hong Kong really isn’t considered China. Go check out Chongqing, Beijing, Suzhou, Chengdu, Harbin, Guangzhou. That is China! Not that I necessarily disagree, but, why do you think Americans are brainwashed? And by who/what? I do work with a Chinese man/company who now lives in New York. He left because the communist rule was unbearable. Years ago and still now- the government continues to control how the people think, live, etc. They force people into labor camps to produce goods for US for pennies- he left China to have a better life and to have more control over his beliefs, etc. I don’t care how fast a country is growing…if they mistreat their people, what good is it? I’m sorry but your description of China sounds like hell on earth. I have never had the desire to visit let alone live there. And the pictures of the smog in China that I see on the internet are disturbing. I think your decision to go to NYC was the better choice. Maybe, but it’s always fun to dream. At least my Mandarin would be impeccable by now. Nice article and welcome to Asia. Having been to Wuxi (2 hours West of Shanghai) and Dongguan many times, I may think about working in China for a short time if there was a lucrative opportunity, and I am talking a $1M per year. The pollution and lack of food security makes the location a hardship. Of course it depends where in China the post is, I believe some cities are nicer than others. Bringing my wife and baby to live in Wuxi seems a pretty tough decision to make. There are so many people I know who work Monday – Friday in China and return to Thailand on the weekend. I guess I’ve been lucky to live and work here all these years. Donno if $1 million is enough due to the air pollution. Nice golf courses in Dongguan! I really enjoyed this article! You should write more in a similar vein. Right now China does seem pretty invincible and their ‘great experiment’ seems like it will go on forever. But China is still run by aging communists and at some point the experiment will probably fail. Their centralized government continues to operate under the premise that it can manipulate banking and bank inflation to orchestrate their economy, but the Chinese economy will eventually experience a major recession. Many of their bubbles will pop – especially the real estate bubble – and huge losses will be extracted from those who invested big time in the boom part of the cycle. When bubbles are pumped up with central bank fiat money, they eventually pop. Up to now, the gigantic advantage that China has held is in large part due to its massive availability of low-cost manual labor. But that advantage is quickly fading (automation, robots) and the labor share of China’s economy will continually decline as the work chases the cheap labor less and less. What happens then? Can they make this transition without civil unrest? Thanks Chaz. But it cost me about $10,000 to write this article (expensive to get there and live) and then the travel time, writing time, etc. Hence, once a year is probably more likely! Civil unrest will happen when there aren’t enough jobs to pay migrant workers, and when the rich get even more rich and in everybody’s faces. I think we’ll need another generation to see huge cultural change. The fact that China has few regulations on pollution scares me. We all live on this one planet, after all, so their decisions will ultimately hurt the entire planet. Sam, I LOVE hot and spicy food and have a stomach of steel. I would love to try their cuisine. Wouldn’t you argue that when we (the US) were in the same development stage that we didn’t care about pollution either? Grow, grow, grow! Think back to the stories from the Industrial Revolution. Just a thought. No, I wouldn’t really argue that. We (including China) know a lot more about our impact on the environment in 2014 than we did in the 18th and 19th centuries. Ignorance is not a valid excuse in this case, and I hope you’re not implying that businesses in China somehow have no clue what they are doing. No, of course not. My argument is that it’s not important (to them) at their current development stage. Their goal is grow, grow, grow. But now I think they’ve hit the point where it’s starting to matter (to them) with cities shrouded in pollution. It’s economic theory related to Kuznet’s curve – you grow w/o concern for the environment until you reach a certain income/GDP point. Unfortunately, it’s very likely that China won’t have several centuries to figure it out. They are devastating not only their own environment in the process, but all of ours since pollution is easily carried with wind and sea. Centuries ago, we did not have access to the kind of technology and data that we have now, which is why we polluted with wild abandon. China cannot say the same and I believe their actions are irresponsible and incredibly short-sighted in light of that. Who will care how great and HUGE their economy is once we no longer have a habitable planet to live on? I’m not making the argument saying that it’s right, merely pointing out the theory behind it, which makes sense from an economics standpoint. Like I said, I think they’ve hit (or are very close) to the inflection point on the curve where they’ll start switching gears.